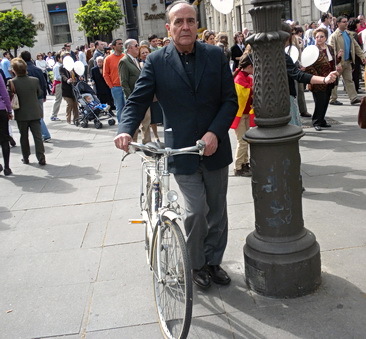 When I was cycling from the north, Cordoba to Seville, Spain, I entered into red-coloured bike lanes 11 kilometres outside of the city. As kilometres decreased, the bike lanes became separated from the general traffic lanes as the city’s network of green cycling lanes unfolded. 120 km of separated bike lanes were spread throughout the city, with average width of 2.5 metres. These bike lanes run from the highways at the northern edge of the city into the southernly suburb of Bellavista and beyond –as the green way for cyclist. 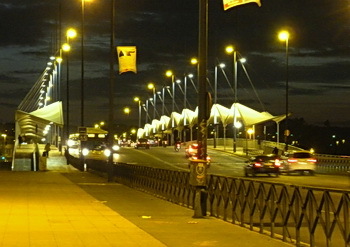 The lanes also intersect west to east from Rio Guadalquivir to the suburb of Torreblanac with riverside paths and arching around the Centro with feeder arms radiating outward. Lanes have a smooth, green surface, with white centre lines, cycling and wheelchair stencil symbols abd speed reduction signs with directional arrows before pedestrian crossings. Cyclists can just glide through the city separated from car traffic. Dapper yet casual with his bike. Seville, Spain Mar. 2011. Photo by HJEH Becker. 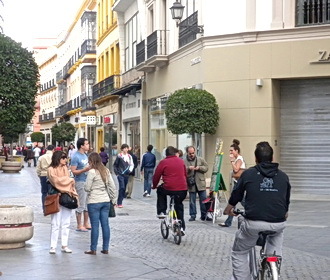 Pedestrian crowds were plentiful during Seville's ciclovia-- a car-free, mass pedestrian-cycling event. Faster running green images of people signal that the crossing time is coming to an end at traffic light intersections. Within 5 years, the cycling mode share in Seville has increased from insignificant to about 6% as this massive network was quickly formed. Some of the cycling facilities replace parking or traffic lanes on the road, separated by half moons of concrete. Other separation may be railing at handlebar height, between cycling path at sidewalk height and traffic lanes. Some cycling facilities are parallel to pedestrian paths. At intersections, cycling paths take sharp turns for street crossings parallel with pedestrian crossings. Intersection crossings are long, sometimes as long as 51 seconds. The crossings are not efficient from cycling travel time perspective. On bridges, the paths tend to be narrow, sometimes made narrower with light standards penetrating into bike lane space. Bike lanes have flowing cycling traffic behind bus shelters. The cycling lanes are normally not wide. When available sidewalk width becomes insufficient for both pedestrians and cyclists, the cycling lane widths are diminished to whatever is available. 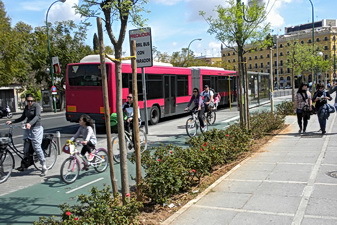 While the Seville separated bike lanes network is attractive for pleasure cycling, they are inefficient for commuting. The carrying capacity has most likely been reached. What will be the city’s strategy for expanding capacity as it is needed? On Sunday, families with young children were on these facilities, cycling carefree with separation form the car traffic. A father was running beside his child on a bicycle with training wheels and balancing the child as she takes her first few metres toward hopefully, a life of cycling. Young adults were there in very social mood. Spandexed and helmeted men were out with their racing bicycles. Yes, separation with well-marked, green lanes, invite people to cycle. The visual bike greenway lane has a positive effect. Seville is a good example. Thanks for the info. 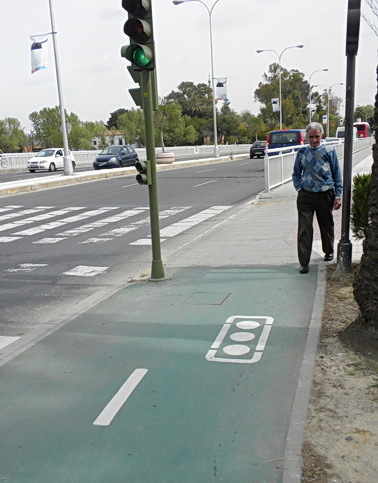 I’ll be riding into Seville from the Vía de la Plata in a few weeks, hopefully I’ll avoid the motorway and get onto one of these cycle paths to guide me into town.